Gym at midnight or stroll on their lawns, politicians — from Rahul Gandhi to Rajnath Singh — are not letting busy schedules get in the way of a healthy life. New Delhi: Indian politics is undergoing an image makeover. The age-old stereotype of the potbellied, white-kurta-wearing minister is fast fading, with our elected leaders now younger, fitter and more fashion-conscious than ever before. Prime Minister Narendra Modi has single-handedly, with perhaps a little help from Baba Ramdev, made yoga fashionable, and he is also seen as the only PM after Indira Gandhi to show an enthusiasm for sports. With the PM’s front-and-centre fitness focus, many Indian politicians, including the old guard, are feeling the pressure to follow suit — prompting them to go public with the details of their fitness regimen, often accompanied by photo and video updates on social media. In the midst of their demanding schedule, which makes both timings and locations unpredictable, incorporating a fitness regimen becomes a matter of great discipline. But whether it’s making time for a run early in the morning, or practising yoga in their garden, our political leaders are going the extra mile to lead a healthier lifestyle. The Vice-President has a badminton team at home comprising his staff. The Union Home Minister loves to work out at home. The carefully manicured lawn of his government bungalow at Akbar Road is his favourite place to exercise, which includes yoga. He takes a 20-minute walk twice a day, in the morning and when he returns from work in the evening. He is very particular about the walks, never missing one even when out of Delhi. Only heavy rain has been known to keep him indoors. This devotion to his workout allows him to ignore the dietary restrictions usually associated with a fit lifestyle to have his fill of desi junk food like laddoos, kachoris and special namkeen. The Gandhi family swears by meditation, a relatively well-known fact in light of Congress president Rahul Gandhi’s frequent visits to meditation centres. Congress spokesperson Randeep Singh Surjewala told ThePrint that the family considered meditative spirituality to be “very enlightening and calming”. “All three members of the family meditate,” he said, referring to Rahul, his sister Priyanka and their mother Sonia Gandhi. But what’s not as well-known is that the Congress president maintains a rigorous and regular workout schedule, which includes a 12-km run every alternate day. 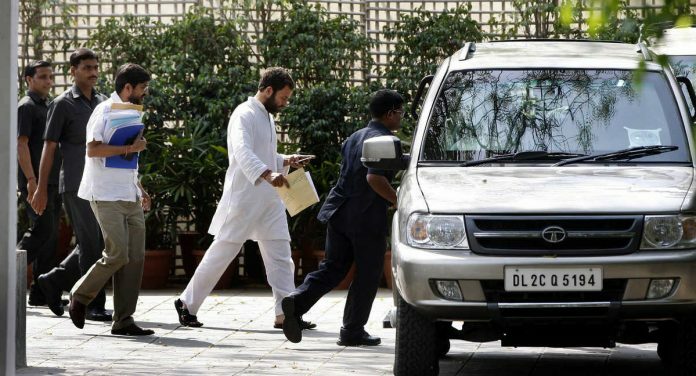 “Even if he gets free at midnight, he’ll come home, wash up, and go for a run,” said Surjewala. “Even on the campaign trail, if it’s 11, 11.30 pm [when he gets free], he makes time for a run,” he added. Sonia and Rahul are also consistent practitioners of yoga, according to Baba Ramdev. The Union Minister of State for Home is also known to be a fitness enthusiast who believes in anywhere-and-everywhere exercise. With no fixed regimen or favourite gym, Rijiju exercises whenever he can with whatever he gets. He loves cycling, and represented the government at a recent cyclothon. The Union Minister who counts youth affairs and sports among his portfolios has won the Arjuna award and Khel Ratna on account of his career in competitive shooting. He started the viral #HumFitTohIndiaFit campaign with a video of him doing push-ups in his office. The fitness freak works out a gym at home, and relies on walking to compensate for other exercises when out for trips in his constituency, Jaipur (Rural) in Rajasthan. The Union Human Resource Development Minister is an ardent believer in the benefits of walks and yoga. Like Rajnath Singh, he prefers to perform his exercise regimen on the lawns of his government bungalow. When in Delhi, the Minister of State for Rural Development loves nothing more than a run on the stretch outside his Mother Teresa Crescent Road residence, where he makes at least 20 rounds. Back home in Patna, he loves walks at the Gandhi Maidan, where he also meets his constituents. The MP was often seen running or jogging on the stretch from Janpath to Raisina roads, but this is now rare, with Thakur preferring a game of badminton at the Constitution Club of India. The cricket aficionado captains the MPs’ team during the annual charity matches played by politicians every year. Usually busy in the morning, he squeezes in a workout late at night, often after 11.30 pm. The Science Minister and doctor loves cycling, warm-up exercises and yoga. To keep his cycling regimen exciting, he changes his route every alternate day. Some days, it’s the 5.6-km stretch from his residence at Tees January Marg to the BJP Delhi headquarters, while at other times he cycles the 3.4 km between his home and Jawahar lal Nehru stadium. The Chandni Chowk MP also takes late-night walks at Lodhi Garden or the lawns of his official residence. Late-night workouts seem to be a trend among the younger leaders, with this MP and former Bollywood aspirant often turning up at the 24×7 gym at The Lalit, Delhi, around 10 pm whenever he is in Delhi. His two-hour exercise regimen includes weights, functional training and cardio: Clearly, while he has left his starry days behind, his love for rigorous exercise for a chiseled frame has not waned at all. In his constituency, Bihar’s Jamui, he sticks to stretching and yoga in the morning. He also keeps a close eye on what he eats. The Nationalist Congress Party (NCP) MP for Maharashtra’s Baramati alternates between walking, cycling and yoga. Her regimen, which ranges from 20 to 90 minutes, largely depends on the time she has. Whenever Sule is in Delhi, she goes for a morning walk at the Lodhi Gardens. She tries to avoid fried food, but has a weakness for cheese and desserts. Sule says she keeps her weight in check by using her jeans size as a benchmark not to be breached. The MP for Guna, Madhya Pradesh, works out six days a week, switching between weights, a cross-trainer, and a run on a treadmill at the gym. The erstwhile royal uses a Fitbit to monitor the total number of steps he has walked, and also likes to swim and play badminton. He is careful about his daily diet. The Congress spokesperson and former I&B minister undertakes a 5-km run on days when the weather is good. With a work schedule that keeps him on the road for vast swathes of time, he said, his fitness regimen was one shaped by from practical convenience. His favourite city to run is Chandigarh, where he also often cycles. In the summer, Tewari heads to a gym to beat the heat outside, alternating between a cross-trainer, cycle and weights. Having captained the Chandigarh and Panjab University swimming teams to various national and inter-varsity championships, Tewari likes to swim 20 laps of a 50-metre pool when he gets the time. He participated in Rathore’s ‘Fitness Challenge’ by tweeting a video of himself doing push-ups. The public didn’t respond as he might have hoped, and Tewari was trolled for promoting an initiative taken by the rival camp. The MLA from Haryana and chief Congress firefighter loves playing sports more than watching them. Throughout his career as a politician, he said, he had endeavoured to maintain a fairly active lifestyle — be it playing badminton and squash intermittently, or finding time for a run or walk while on the job. In the midst of an erratic work schedule, which he says has “gone haywire in the past five months”, Surjewala still squeezes in a daily run. He runs for two kilometres and walks for three to complete the 5-km circuit at the Siri Fort Sports complex when in Delhi, around the lake in Chandigarh when he visits his hometown, and around the Bidkyar lake when in his constituency, Haryana’s Kaithal. He prefers evening walks, because mornings are generally reserved to prepare for the day ahead. Surjewala also loves to play cricket, and jumps at every opportunity he gets, “even if it’s only once in six months”. His biggest wish, however, is to succeed at tennis, which he considers the “best and most holistic exercise for your body”. As for eating restrictions, Surjewala said he was not a foodie, and his love for fruit and vegetarian diet made keeping fit easier. The Congress MP takes evening and morning walks at the Lodhi Garden. The Union Minister of Steel is also a regular at the Lodhi Garden. The Congress MP, again, loves a good morning walk at the Lodhi Garden. The former Haryana chief minister takes a morning walk at Nehru Park whenever he is in Delhi. The Union Minister and former diplomat has started wearing Fitbit, keeps track of his calorie intake. The Deputy Chief Minister of Delhi and Aam Aadmi Party leader has always taken good care of his health. Until work, with frequent visits outside Delhi and late-night meetings, disrupted his routine, he loved to take morning walks, India Gate being a favourite spot. He now manages his fitness with in-house exercises. The AAP MLA and former Delhi minister makes it a point to take a morning walk at a park near his residence. According to him, the walks help not just physical, but also mental health. He sticks to his walks even when travelling for work.